When considering solo singer songwriters there have always been a few whose next release is anticipated with great excitement, knowing the quality of everything on the disc is going to be pretty much unsurpassable by anyone else. 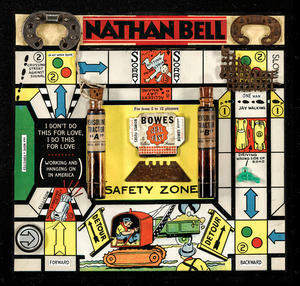 People such as John Prine, Guy Clark, Townes Van Zandt and just a few others were on that list that now sees the addition of Nathan Bell. That addition was cemented during the first listen to this tremendous album of reflections on life. To my knowledge this is Nathans seventh album release and believe it or not, the fourth that has been reviewed on this website! He is one of very few artists, Eric Taylor for example, who is a writer as much as he is a musician. He is able, in just a few words, (yes I know, I should take a leaf out of his book) to get inside his subject, whether a person, a collection of people or even a situation and give an in depth depiction that creates a relatable, evocatively descriptive world, creating an atmosphere that enables us all to get completely lost in the story in much the same way as a good page turner book. That is more than sufficient for him to be classed as a tremendous talent but then you must add his virtuosic guitar playing abilities, which should be more than enough to be going on with but of course all good story tellers need a voice that gets the best out of their depictions. Nathans raw yet melodic vocal style is more than adequate to give believable evocations of what is in his mind, similar to an artist such as Guy Clark or the aforementioned Taylor. The instrumentation on this recording is sparse but never found wanting, with just the right amount of coloration, making me think this could, with time, turn out to be his best album yet. The core band that more than plays its part on the album, is made up of some hugely talented individuals and includes Nathan on acoustic guitar and lead vocals, Missy Raines on bass, Ethan Ballinger, electric guitar, Cody Martin on drums, Jarrod Walker on mandolin and various vocalists providing their harmonies where necessary. There are complexities within these songs that very few other recordings can boast of. They are tales of the unremitting hardships to which many are subjected and the sheer lack of hope that goes with their acceptance, although conversely there are just a few little oasis of hope that with luck it can be possible to rise above the grinding poverty to which they are subjected. Much of the album approaches similar subject matter from slightly different angles; at times the songs being linked so well it almost becomes a concept album. The tempo's of these tremendous compositions and the sparse instrumentation give the album a laid back feel but at the same time there is a lyrical and vocal intensity to every song on the disc. Dust gets underway with an acoustic and weeping steel guitar intro on a quite stunning depiction of hard lives and the ability to get much out of very little. The beautiful vocals of Annie Mosher take some verses whilst Claire Lynch adds some gorgeous harmonies, with mandolin and melodic electric guitar adding to the beauty that is underpinned by bass and percussion. There is a nice harmonica, guitars and mandolin for support on All that you carry, a walking pace ballad that tugs at the heart strings as it tells the story of someone beaten down by a life that was never really within his control. He has probably always known it but has now reached full acceptance, although that acceptance makes it no easier. The edgy electric guitar rubber stamps the harshness to which some are subjected. As befits a song with the title Stamping Metal (Strike) the percussion gets things going, soon joined by acoustic and electric guitar on a genuinely harrowing tale of a family who have to leave their home and find work in the city, in this case Detroit, just to survive. It gives a powerful and scary picture of the sheer grinding harshness of the work, with an arrangement that perfectly encapsulates the horrors of this life with the repetitive mandolin and edgy electric guitars removing any soft edges from the song. There is a slow moody acoustic guitar on Jesus, Of Gary Indiana a tale that depicts a town that no longer has the factory from which our hero earned his living, with him now forced into bar work to survive. The lovely female harmonies seem to add an extra depth to the emotion content of a hopeless situation. The song further gets to the root of a working man's problems in that the understanding is there to know what is happening even having a partial if sad acceptance of a situation that is brought about by 'money men' who have very little humanity and probably even less of an understanding about real life. It is a sparse, haunting song that should provoke thought in those who have the power, always assuming they have the great musical taste to listen to music of this depth rather than their usual 'wall paper music.' Unlikely! If ever there was an album that could never be described as easy listening but never the less is hugely rewarding to listen to this surely must be it, with its blend of memorable melodies and heart tugging stories. It tells snippets from the lives of the downtrodden and should provoke thought in even the most hard hearted. In some ways this is a blues album with its depictions of the sheer unrelenting harshness of the lives of the albums subjects. A few even remind me of some of the powerful depictions in John Prines self titled debut album but many of the situations on this recording would have been far less palatable back in the early 1970s and a general sanitization would have had to have taken place. It says a lot about the changing times that stories such as these can now be open to the public, but it's quite an indictment that they are still so relevant. Having said that, without them we wouldn't be treated to an album that whilst often challenging is one of the most rewarding albums so far this decade.